During one of our lunch breaks at our WSI Excellence & Innovation convention I had the pleasure of sharing a table with Jeffrey. He is really approachable and a pleasant guy to talk to. We spoke about his book, Waiting for your cat to bark and discussed the persuasion ideas that he presented during his keynote speech. 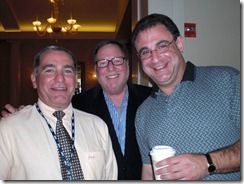 I was also with my good friend Ronnie Adelman, one of the original WSI ambassadors and my mentor. Ronnie is a well known speaker on the WSI circuit and is currently arranging a Digital World Tour where the top WSI Internet Consultants will present. He plans to hold these conferences in 36 countries worldwide. He loves to travel and I am hoping to join him on a few of these conferences. Ronnie & I are planning to hold one of the Digital World Tour conferences in South Africa next year and with a bit of arm twisting we are on the way to getting Jeffrey to present with us in South Africa. Hopefully in May 2010. Here we are posing for a picture with Jeffrey. From left to right, Francois Muscat, Ronnie Adelman, Jeffrey Eisenberg.